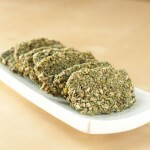 A 100 calorie raw snack, high in enzymes, healthy fats, and nutrient rich spirulina. Pulse pumpkin and sunflower seeds in food processor with “S” blade. Remove and place in a small bowl. Using same food processor bowl, blend banana and dates until smooth. Add pulsed seeds and all remaining ingredients to the bowl. 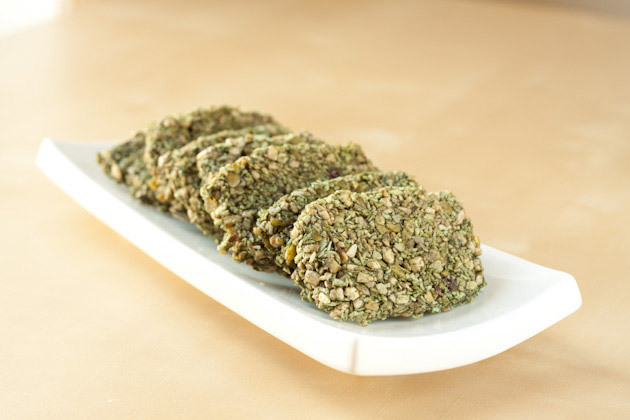 Mix quickly with food processor before shaping mixture into small bars. Dehydrator version: place bars on teflex sheets and dehydrate for 8-10hrs at 105F. You’ll know the bars are done when they’re crispy on the outside and firm on the inside. Freezer version: place the bars on a parchment paper lined plate and stick in the freezer for 10 minutes to firm up. Bars eaten right out of the freezer work well but will become soft in 15 minutes or so. You + Me = Synergy. My Affiliate Program… and Why You’d Be Great For It!